Vigee Le Brun arrived in England in 1803. She took an immediate dislike of the country, its climate, its customs, its art, and with few exceptions, its people. One of these exceptions was Mrs. William Chinnery, the subject of this appealing portrait. Details concerning Mrs. Chinnery's life are sparse. Her maiden name was Tresilian. She was an accomplished pianist and a popular hostess whose house on Portman Square was frequented by the cream of London's high society. The Chinnerys were intimate friends of the Duke of Cambridge, a son of George III. Mme Le Brun described her English sitter as "a very handsome woman whose mind had great finesse and charm" (Souvenirs, III, 192). The two were probably introduced to each other by the celebrated violinist, Giambattista Viotti, Mrs. Chinnery's protege, who had frequented Vigee Le Brun's salon in pre-revolutionary Paris (on Viotti and Mrs. Chinnery, see E. van Straeten, "Viottiana," Connoisseur, XXXI, No. 123, November 1911, pp. 152-160). One of the artist's first excursions outside London was to the Chinnery manor of Gilwell at Sewardstone, near Walthamstow, where she spent a fortnight. "When I arrived I saw the entrance way decorated with festoons of flowers wrapped around the columns. On the stairs, which were likewise adorned, little marble Cupids placed at intervals held vases filled with roses. This was in short a fairy-like spectacle of springtime. As soon as I entered the salon two little angels, Mrs. Chinnery's son and daughter, sang for me a piece of enchanting music that the amiable Viotti had composed for me.I was truly moved by this affectionate welcome, and the two weeks I spent at Gillwell [sic] were for me days of joy and contentment" (Souvenirs, IIL 192).Vigee Le Brun's friendship with Mrs. Chinnery lasted long after she left England. 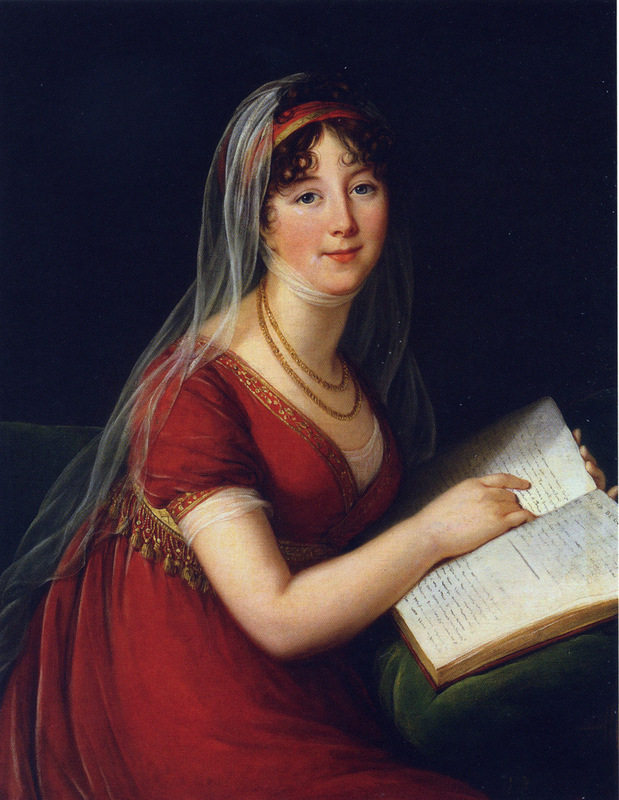 In 1819, Baron Crespy Le Prince engraved a portrait of Mine Le Brun which he dedicated to "Mistress Chinery [sic]." Mrs. Chinnery had three children, George (not to be confused with the Irish painter of the same name), Caroline, and Walter. In addition to the portrait of their mother, Vigee Le Brun painted likenesses of the two younger Chinnerys, neither of which has been traced. None of the three children appears to have outlived their mother. When she died, having no direct descendants, her estate was left to the aunt of a certain Algernon Green of Surbiton, who subsequently inherited it. In this painting the sitter is represented leaning on a velvet cushion reading a book by the French authoress Mine de Genlis. Vigee Le Brun repeats the pose and to a certain extent the color scheme of the 1785 portrait of Marie Antoinette (cat. no. 19). Costume and hair stvle reflect the taste of Consular France more than that of Georgian England. The diaphanous gauze veil set off against the dark background is a motif Mme Le Brun mav have picked up in Italy from her study of seventeenth- century Italian painting. Somber, monochromatic backgrounds were used by Vigee Le Brun as early as 1782 (see cat. no. 11), and they abound in the portraits dating from the Russian and post-Russian periods (e.g., cat. no. 43). PROVENANCE: Galerie Sedelmeyer, Paris, by 1905; Paris, Galerie Georges Petit, Vente Sedelmeyer, May 16-18, 1907, lot 251 (bought by Dufayel); with Thomas Harris, London, as of 1939; Wildenstein, New York, 1947; acquired in 1975 by the Indiana University Art Museum, Bloomington. MAJOR EXHIBITIONS: Paris, Galerie Sedelmeyer, 100 Paintings of Old Masters, 1905, no. 72; New York, World's Fair Exhibition, Exhibition of Treasures of French Art from the Renaissance to Modern Times, 1964, no. 71. SELECTED REFERENCES: Souvenirs, III, 349; Helm, [19151, pp. 150, 192, illus. facing p. 144; Blum, 1919, p. 103.